Call Pioneer for fast and effective gutter and downspout repair. Torrential downpours, hurricanes, high winds and heavy snow storms can wreak havoc on a roof. When a disaster hits, you need to act fast to prevent further damage and return your facility to normal as quickly as possible. 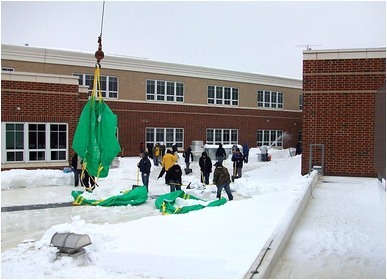 Pioneer can provide the skilled manpower needed to quickly address your roofing needs in an emergency. If your facility is at risk of potential damage due to its location, we offer pre-storm agreements to establish advance authorization and collaboration on a plan so our crews can be ready to go. When our crews arrive they will inspect the roof, assess the condition and begin making temporary or permanent repairs or clearing the roof of snow or debris. Preventive maintenance is the key to making a roof last. Pioneer offers preventive maintenance programs to proactively keep your roof functioning throughout its service life. The goal is to identify problems before they become expensive repairs, maximize the life expectancy of your roof and assist in evaluating repair-replacement needs. Leaks that go unnoticed can cause significant damage to roofing materials and adjacent surfaces. Leaks that are left unattended can cause significant damage to roofing materials and structural components well beyond damage to interior finishes and impact on usable space inside the building. Pioneer's Preventive Maintenance Agreements offer a proactive approach to identifying and repairing leaks before they become active or cause widespread damage. Potential leaks identified early cause less damage and cost significantly less to repair. Providing a proposal for major repairs or power washing needed. The manufacturer's warranty covers the cost of repairing active or reported leaks caused by materials and workmanship. However, the warranty only obliges the manufacturer to repair leaks as they occur, and the method and manner of repair is up the discretion of the manufacturer. The repairs may or may not cover the cost of damages to roofing materials depending on the type of agreement. Likewise, the warranty does not cover leaks that originate from adjacent surfaces or damages from leaks that are ignored or left unattended. To remain active, the roof warranty requires building owners to report leaks in a timely fashion and maintain the roof system and adjacent surfaces during the warranty period. The manufacturer's roofing warranty does not cover maintenance.